Title: " Ashokan Rainbow "
Robert Selkowitz recently tasted trout for the first time...it was good. This project got him to look at trout more closely. 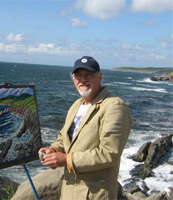 Robert is a landscape painter who usually works from life in pastel. 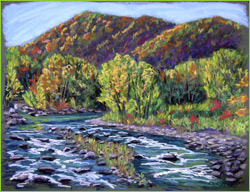 The two pastels illustrated on this page were painted alongside the Esopus Creek. 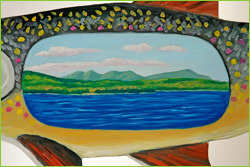 Robert titled his work for this project Ashokan Trout, and it depicts a Rainbow Trout with an inset view of the Ashokan Reservoir. 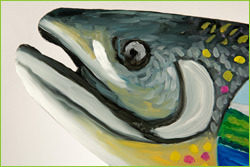 He imagines there are some big fish in the reservoir, maybe as big as this oil painted image on aluminum. Robert Selkowitz has his home and studio on Route 28 in Ashokan. He is a long time Catskill Mountain region resident and has a BA from Cornell University and an MFA from Bard College. 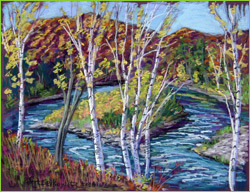 He is the author of A Painter's Path through the Catskill Mountains.